Terminating someone is never easy, but if your nanny has only been with you a short while, there’s usually some comfort to be found in the fact that you’ve had a relatively brief working relationship. However, letting go of a long-term nanny can be a much tougher situation. You’ve both got more invested in the position, and even though she is an employee, you inevitably will form a personal connection to someone who is working in your home every day and caring for your children. Chances are, you didn’t come to this decision lightly. However, there are some things you can do to make the process a little easier. 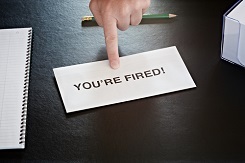 The best way to guide yourself through the firing process is to lay out your reasons for the termination and make your case clearly and calmly. Talk with your nanny about what she has done to violate your rules, cite instances in which you’ve admonished her, and point out the way that she has failed to show improvement. If you’ve got a nanny contract — and you really should set one up upon hiring your nanny — you can use it to highlight what she has done and talk about how her actions no longer meet your expectations. For instance, if she is expected to regularly pick up the kids from school but has been late to the pickup multiple times, discuss it. This is also when you should look to your contract to let you know what’s expected of you in terms of notice and fairness. If you’re firing your nanny in somewhat calmer circumstances, attempt to give her the same amount of notice you’d require from her if she were to resign. If this is a termination brought on by more troubling signs of negligence, act swiftly and be sure to pay your nanny up through her termination date. When terminating your long-term nanny, remember that this is someone who’s become an extension of your family’s daily life, and that she deserves to be treated with compassion in what’s going to be a tough time for all involved. If she has done something to break your rules, the firing will still come as a setback, but if you’re letting her go for any other reason, it’s definitely going to knock the wind out of her sails. For this reason, it’s wise to stick to the facts when discussing her termination and be considerate of the fact that she is going to feel (and act) pretty upset when she gets the news. Even if you don’t feel like it, show a little compassion. It will help. Your child is probably pretty attached to your nanny if she has been with you for a while, so firing her is going to cause some confusion as your child adjusts to a new caregiving routine. If possible, try to arrange a transition period where your child can get to know a new nanny while still having some contact with the old one. This will act as a kind of bridge to the new chapter and allow for a smoother changing of the guard. If you’re letting go of someone who’s been working for you for a while, it can be easy to approach the situation almost entirely as an emotional one. However, there are plenty of logistical things to consider. For instance, depending on the nature of your contract and whether you had one in place to begin with, your former nanny might be eligible to collect unemployment. That means that you need to have your employment tax paperwork in order, and if you’re terminating a nanny for poor performance, you should also have documented instances of her violations that you can use as evidence to protest any claim of unemployment payments if you want to pursue that route. Additionally, you should make a list of every piece of your personal property that your nanny might have so that you can collect them upon termination. This could include house keys, car keys, pagers, cell phones, electronics, etc. You may also want to consider changing your locks and resetting your security system’s alarm code (if applicable). Even if the termination was a mostly amicable one, you still have your own security and peace of mind to consider. This person will no longer be your employee, and it could behoove you to make sure she no longer has any way to access your home. Maybe you’re firing a long-term nanny not for anything she has done but because your needs have changed or you are relocating. In this case, it’d be appropriate to consider penning a letter of recommendation that she can add to her nanny portfolio as she moves to new positions in the industry. If you don’t want to provide one in the moment, you can let her know you’d be willing to write one in the future. Your ultimate goal here is to make the process as painless as possible, no matter why you’re firing your nanny. Don’t have the termination meeting in front of your children, or really anywhere near them if you can help it. The point of all this is to serve their well-being, and that’s best done when you and your nanny can talk like adults on your own terms.